Marvel’s X-Men: Schism series begins tomorrow touted as the “X-Men event of the decade.” That’s a bold claim considering recent X-events like House of M, Messiah Complex and Second Coming, but as the title suggests Schism does promise to divide the mutant community and shake up the X-Men’s current status quo. The publication of the X-line will also be altered by the on-page effects of Schism as a new volume of Uncanny X-Men along with a new book titled Wolverine and the X-Men will spin out of this series. 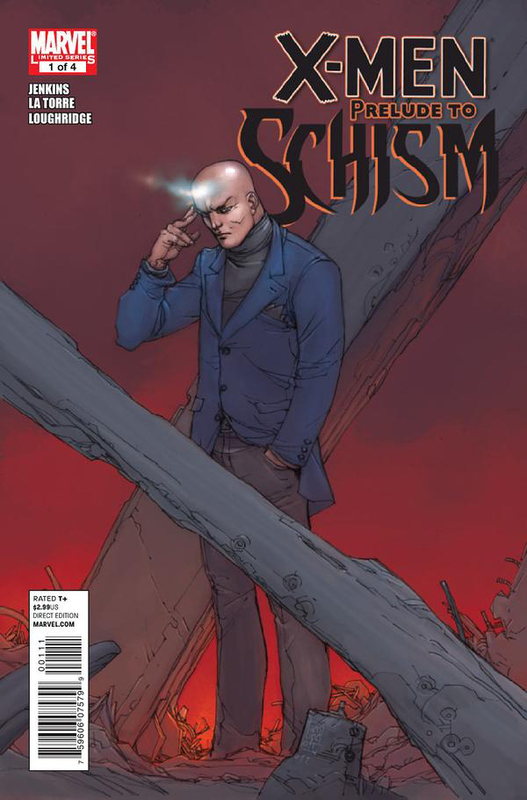 In preparation for the debut of Schism, Marvel shipped a weekly, four issue Prelude to Schism miniseries by Paul Jenkins throughout June. Spoilers for Prelude to Schism will follow along with a lot of speculation about what will drive the X-Men apart this Summer. Paul Jenkins brings an interesting voice and perspective to the series, but I can understand why some readers would shy away from the central conceit of Prelude to Schism. Set during an imminent attack on the X-Men’s island home of Utopia, all the action essentially revolves around the same moment. 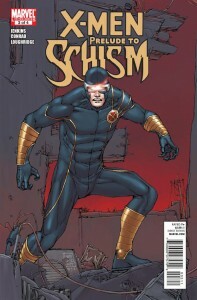 Everyone is awaiting Cyclops’ decision on whether to fight or flee and the series uses each of its four issues to focus on the principal characters of July’s Schism event: Professor X, Magneto, Cyclops and Wolverine. Through the retelling of their histories, we’re treated to insight into the motivations and perspectives of these characters along with their feelings toward Cyclops. We never even find out what the threat is, but we’re assured it’s something big, unlike anything they’ve faced before, and they aren’t likely to survive. Admittedly, it’s easy to come away feeling that nothing happens, but the result is a powerful study of each character and a great way for new and old readers alike to get into their heads. I thoroughly enjoyed every page of it and it really whet my appetite for what’s up next. These are four characters that hold a lot of sway in Marvel’s mutant community and have each had a hand in leading the X-Men. However, none have had the task that Cyclops now does in leading an endangered species into an unsure future. Using flashbacks to explore the history of the focus character in each issue and inform their decisions in the present gives an interesting perspective highlighting just how much shared history these characters have. Particularly in the case of Magneto, anyone who criticized his joining the X-Men will see just how much he respects Cyclops along with a perfectly plausible motive for following his lead. Magneto equating Cyclops to his father is high praise, and it really sells the idea that Magneto would join Cyclops’ X-Men. Even though some will argue it’s grossly out of character, I’d counter that Magneto’s character has been constantly evolving and this is just the latest phase. Also Wolverine’s faith in Cyclops is palpable in the final issue and will hopefully add to the drama when the two ultimately part ways. The tone of faith and belief is probably at its best here as Wolverine reveals just how committed he is to Cyclops despite all of their history. Having Logan admit Cyclops was “the one who believed the most, the one who told us, who said it out loud” was pretty compelling stuff. Different art teams join Jenkins on each issue of the series and bring a diversity of styles to their work. Normally, I don’t like a different artist on each issue of a miniseries but this really works. The various artists on Prelude knock it out of the park and each deserves recognition, but colorist Lee Loughridge is the connecting point of each issue. His use of a muted color palette in the flashbacks is perfect for the tone of each issue and probably my favorite visual element of the series. Robero de la Torre’s interiors are dark and heavy really adding to the mood of impending doom. Xavier’s “children” have been through a lot over the years and this issue hit a lot of the high points, perfectly conveying the emotion in each scene. Their Cyclops looked a lot like James Marsden on some panels, but seeing the big screen version of the character on the page did not take anything away from their work. Andrea Mutti’s images are a perfect fit for the heaviness of a story of Magneto’s family during World War II era Germany. Unexaggerated, realistic figures and faces support a serious tone as we read about Jakob Eisenhardt going from a proud son of Germany in World War I to being murdered by the Nazis in the name of their country. The images of Magneto and Cyclops in costume on the framing pages and his first confrontations with the X-Men look a little off to me, but it’s forgivable given how good the flashbacks look. I’m not familiar with Will Conrad, but I really liked his work on this issue. Some panels reminded me of Mike Deodato and while there’s not a lot of action in any of these issues, Conrad really captures the facial expressions here. As silly as it sounds, my only complaint is that Angel was absent from one of the flashback panels featuring the original team. Minor details like Marvel Girl’s costume lacking a mask and a coloring flub that shows Colossus with an armored body and a flesh head also caught my eye, but they were made up for by an amazing page that transitions from a flashback of Cyclops mourning the death of Jean Grey on a boat at sunset to the current X-Men marching into battle. The second to last page also has great framing panels with Wolverine, Magneto and Xavier reacting to Cyclops’ decision. It’s interesting to note that the same art format is being used for the Schism series itself, but with more conventional super hero artists who each have their unique and recognizable styles.Clay Mann’s art is probably the best of the series, but Andrea Mutti and Roberto de la Torre give it a real run for its money. Unfortunately, Giuseppe Camuncoli’s cover art for the series is only average for the most part, but I did appreciate that the images interlock to read X-M-E-N in the backgrounds. 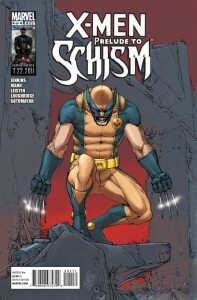 The Xavier image is my favorite of the four covers, but I just did not like the Wolverine cover image. Something about the pose irked me, and those covers are all about the pose. Looking ahead to where Schism might take the X-Men starts with looking back. An interesting element of the flashback pages is that Jean Grey appears in each issue. It’s organic and fits with the story, but a conscious decision specifically to include her seems to be at work. I won’t complain as I always like seeing the “original five” together, but I do have very mixed feelings about her return to the Marvel Universe and I haven’t found myself missing her just yet. It’s unclear whether this was a hint at what’s to come, but it was impossible not to notice. Should Jean rise again, Cyclops and Wolverine would arguably be the most affected by her return and she has long been a source of disagreement between the two. Piecing together the details of the threat that’s on the X-Men’s doorstep leads me to believe that they’re preparing for the return of the Celestials. The Celestials are a race of armored cosmic space giants in the Marvel Universe that have visited Earth and other planets and involved themselves in the development of indigenous species. They imbued humanity with the potential to evolve into superpowered beings and have strong ties to the Eternals, as well as the alien Kree and Skrull. A Celestial long buried beneath the Earth known as the Dreaming Celestial recently relocated and has stood dormant in Golden Gate Park since just before Uncanny X-Men #500. It was last mentioned in the pages of Uncanny when the X-Club traveled back to 1906 in hopes of obtaining mutant DNA only to find that the sample now buried beneath where the Dreaming Celestial now stands. During Prelude, Cyclops mentioned something about being beneath the foot of a giant and Namor cited the ancient stories of his Atlantean people when describing the coming threat. They would have maintained records dating back to the last Celestial visit to Earth known as the Third Host. I believe the status of this particular Celestial may have changed in the now cancelled Eternals series, but I’m not entirely sure. Additionally, the awakening of the Dreaming Celestial was also supposed to bring something called the The Horde (the “locusts of the universe”) to Earth, and this could be part of what the X-Men are preparing for. It’s unfortunate that Prelude and Schism are shipping at a time when the X-Men universe feels particularly diluted by the number of titles on shelves. Selling it as an X-Men “event” also shines a light on the number of events they’re currently involved in. Fear Itself, First to Last, Age of X and the recent return of Astonishing X-Men are all vying for readers’ dollars and it’s hard to argue that it isn’t too much.The fact that Schism will lead to Uncanny X-Men (Marvel’s longest running series with uninterrupted numbering) being replaced with a new volume joined by a new Wolverine and the X-Men series is making the shelves feel a little crowded not only with X-characters but with books having “X-Men” specifically in the title with X-Men: Legacy, Astonishing X-Men, and the latest adjectiveless X-Men. A rift between Cyclops and Wolverine that will divide the mutant community has a lot of potential. I just hope it packs the punch it will need to distinguish itself and merit the attention it’s receiving. This is a great review, of what I think is a great mini-series. The title is a bit false though. 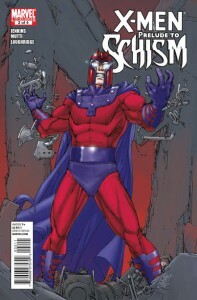 The events of “Prelude” actually happen after X-men:Schism #1. Good post anyway.